After eight years of tackling with ardor “just about every job I was allowed to do,” Kyle Tetting has evolved at Landaas & Company, becoming director of research. As such, Kyle leads the gathering and analysis of market data and investment options. He also is a go-to problem solver and answer man. “I view myself as a general resource to the firm,” Kyle says. Kyle has always thrived on intellectual challenges. As a schoolchild, he read ahead in the textbooks and solved questions before they were asked. 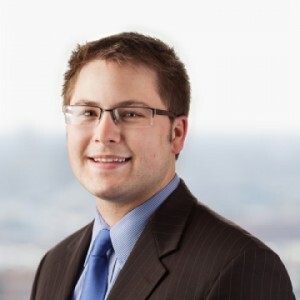 Kyle also advises clients, which benefits his research at the firm level. Kyle is a graduate of Marquette University’s College of Business Administration. He grew up in Kenosha and enjoys playing basketball, softball and golf. He and his wife, Monica, have a daughter, three sons and a dog.